The Trick is the Click! It’s a useful tool for teaching tricks and can be a lot of fun to use. 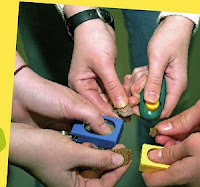 Clicker training was originally used to teach dolphins, but now it’s used to teach all kinds of animals many different skills. The way clicker training works is pretty simple. First you teach your animal companion that whenever she hears the click, she has done something good and a treat is on the way. Once she understands that idea, you can use the clicker to encourage her to try new things and ﬁgure out new behaviors by herself. When she does what you want her to do, you can click and then give her a treat. Pretty soon, she’ll be working hard to ﬁgure out what you want so she can earn that click and treat. Using a clicker is kind of like saying “good!” when you teach the basic skills. It’s a way to communicate to your pet, “Yes, that’s just what I want you to do!” So why not just use your voice? Because,being human, our timing is often a little off. Using a clicker forces us to think about the exact moment our animal companion is doing something we like, and the sound of the clicker marks the moment of the behavior. The click is also a noise that your animal companion won’t hear all the time in everyday life, and she will soon associate it with learning new things. However, if you have trouble juggling treats, clicker, a prop, and maybe even a leash, feel free to use your voice instead of the clicker. You will still get good results. Now try waiting until your pet has lost interest in you and is snifﬁng or looking at something else. Then click. She should turn and run to you to get the treat. If she doesn’t, go to her and give her a treat and repeat the ﬁrst step a few more times. 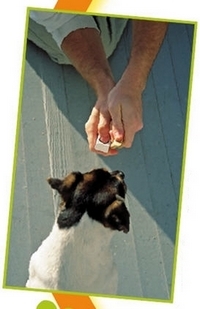 So, for example, if you’ve already taught your pet to sit, tell her “sit.” When she does, click and give her a treat. Try it a few times with each of the skills she already knows. This teaches her that when she does what you want her to do, she can “make you” click and give her a treat.Before you can do any serious training, you need to get your pet used to the sound of the clicker and teach her what it means. Have some treats handy. When you are ready, click the clicker and give her a treat. Right now, she doesn’t have to do anything for the treat. Just click and treat, click and treat. Repeat this several times in a row.